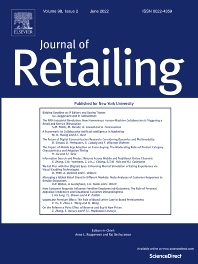 The Journal of Retailing is devoted to advancing the state of knowledge and its application with respect to all aspects of retailing, its management, evolution, and current theory. The field of retailing includes both products and services, the supply chains and distribution channels that serve retailers, the relationships between retailers and members of the supply channel, and all forms of direct marketing and emerging electric markets to households. Articles may take an economic or behavior approach, but all reflect rigorous analysis and a depth of knowledge of relevant theory and existing literature. Empirical work is based upon the scientific method, modern sampling procedures and statistical analysis.